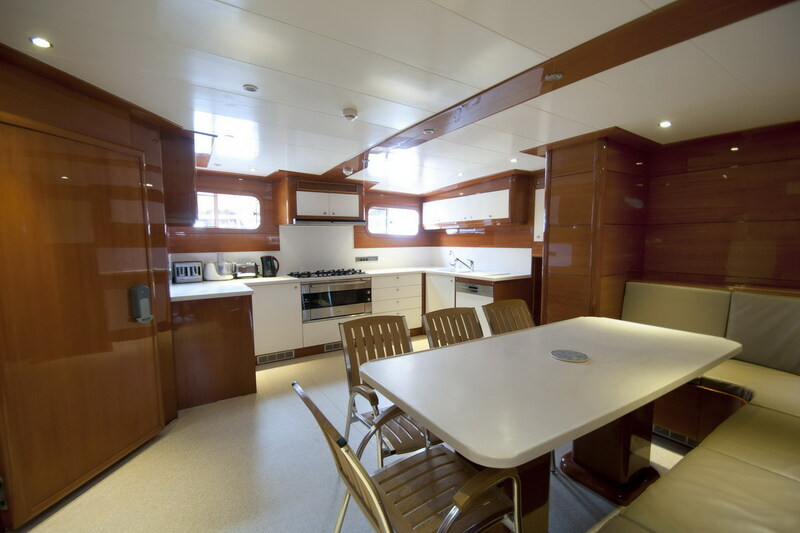 East Mediterranean yacht GULMARIA has a modern elegant interior, featuring warm cherry wood panels, crisp white soft furnishings and plush subtle cream carpets. 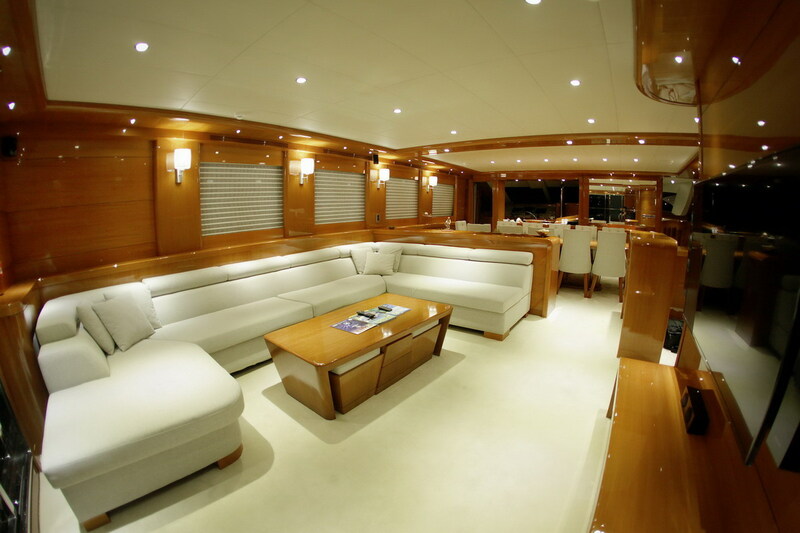 The salon is bright and airy with large panoramic windows, a generous U shaped sofa, coffee table and full entertainment area. 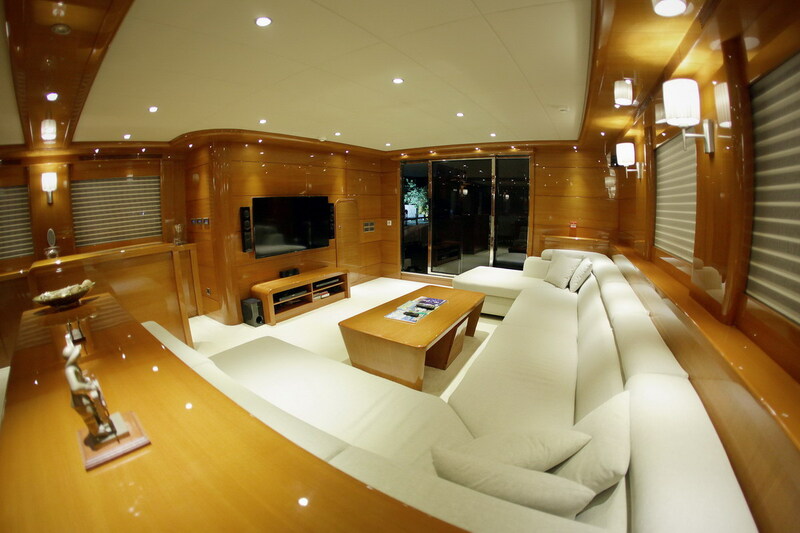 Forward, a low credenza separates the lounge from the formal dining table. 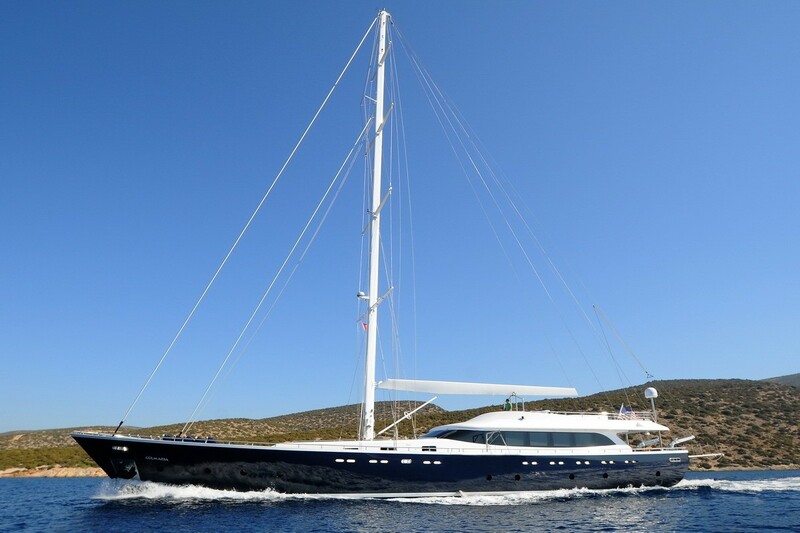 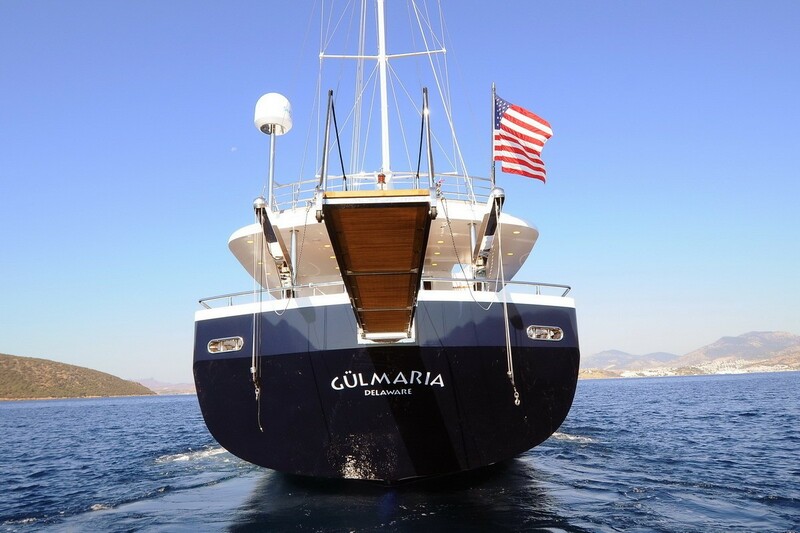 Charter yacht GULMARIA offers ample exterior living, ideal for the warm Mediterranean climate. 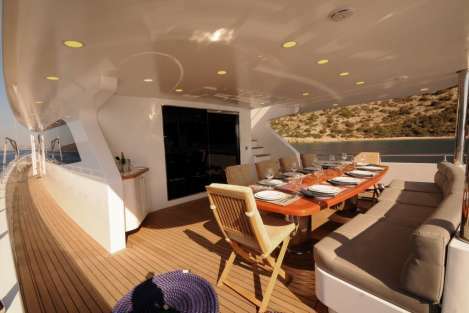 The aft deck is shaded and has an alfresco dining table and seating. 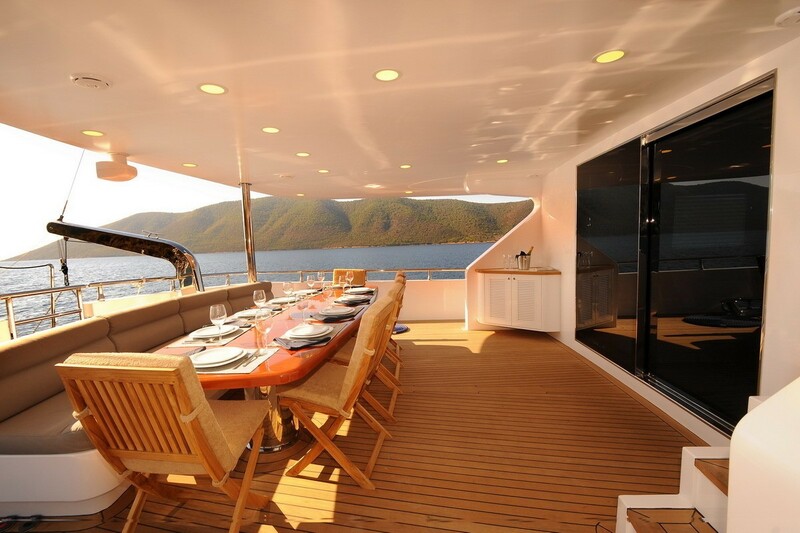 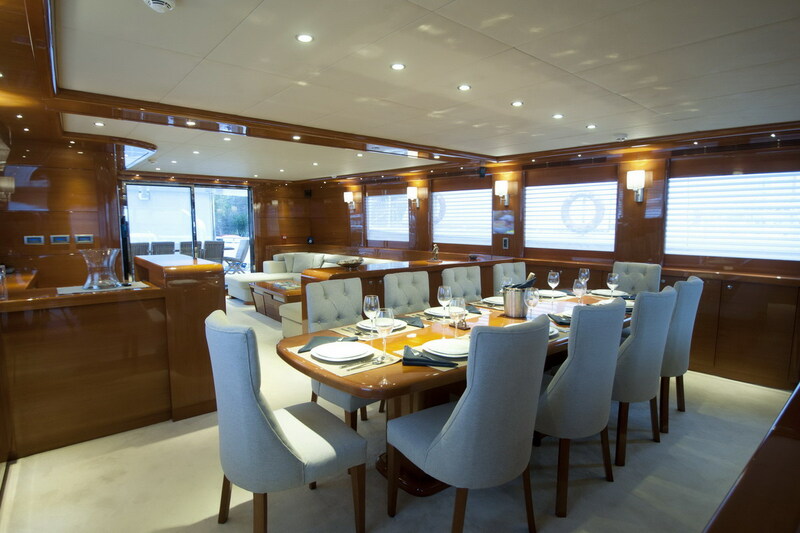 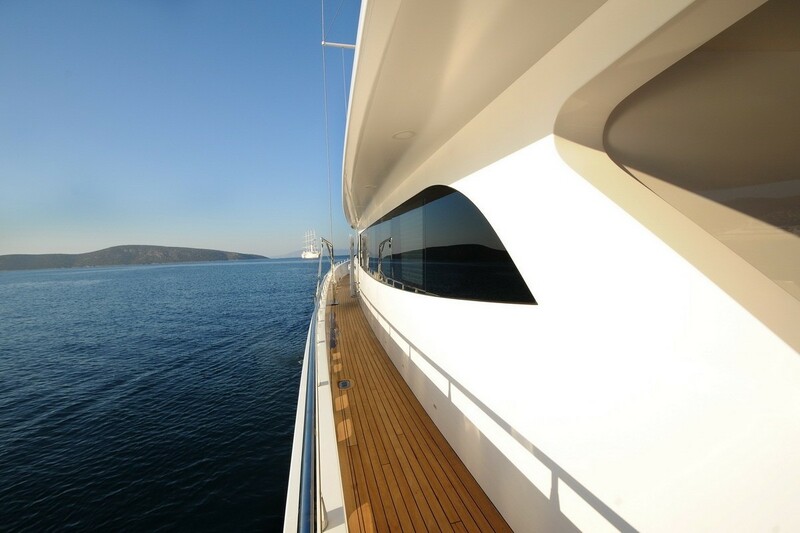 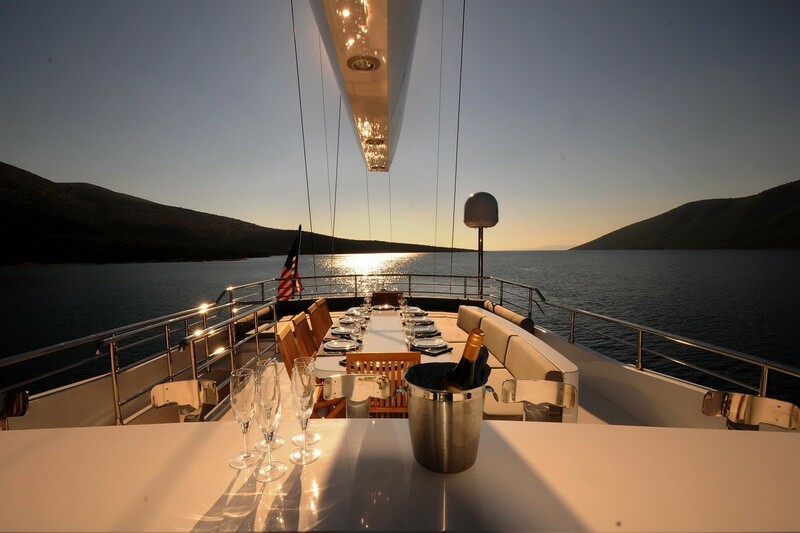 Wide side decks wrap around the yachts main deck, giving guests 360° access. 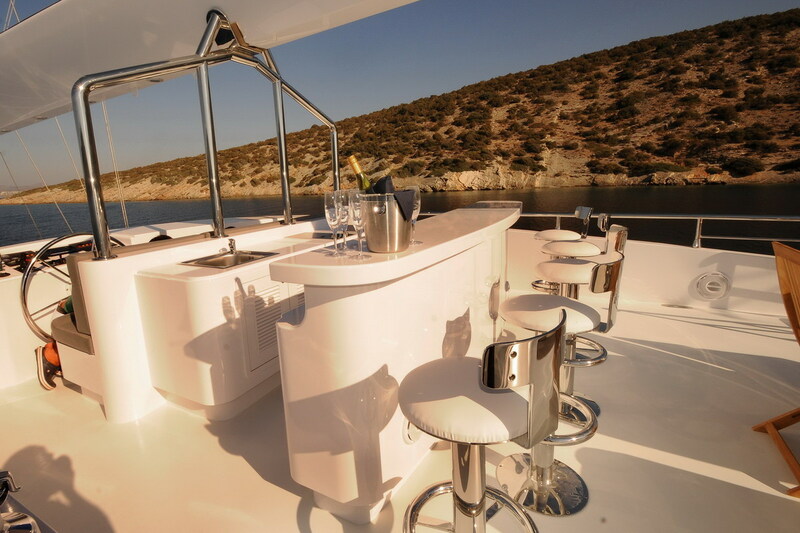 Above the main deck, an expansive flybridge is perfect for relaxing and entertaining, complete with a full width sunpad, alfresco dining option, seating and wet bar with fitted stools. 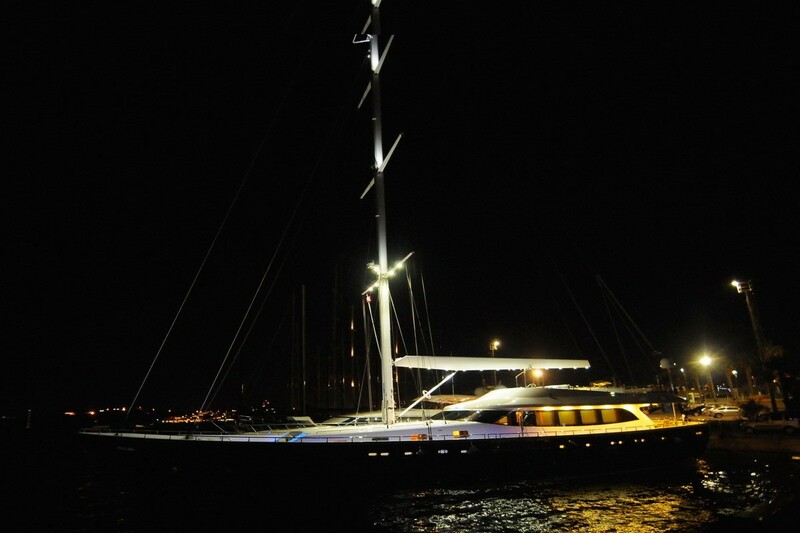 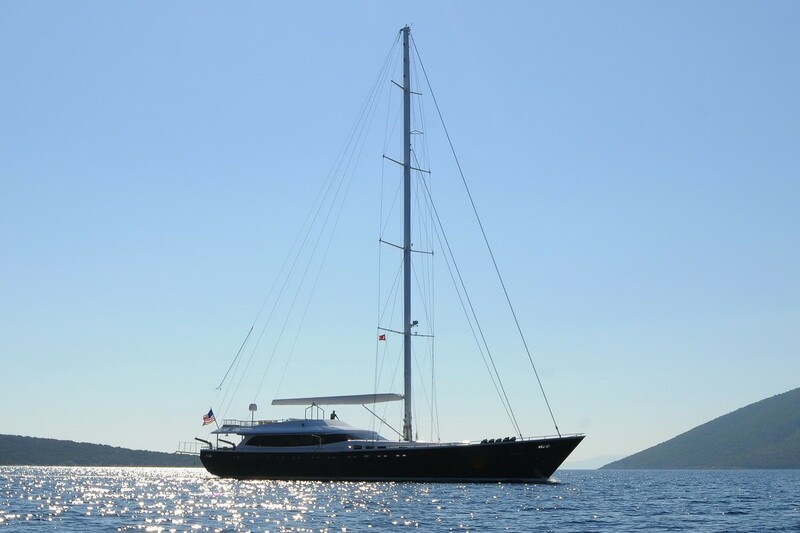 The GULMARIA sailing yacht has a beam of 8.06m (26ft) and a draft of 3.7m (12ft), when not under sail, she is powered by 2 John Deere 375hp engines, capable of 10 – 12 knots. 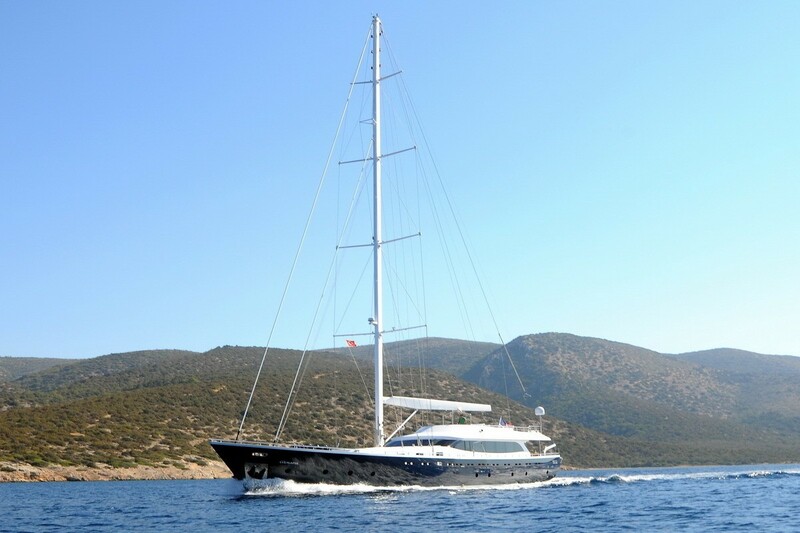 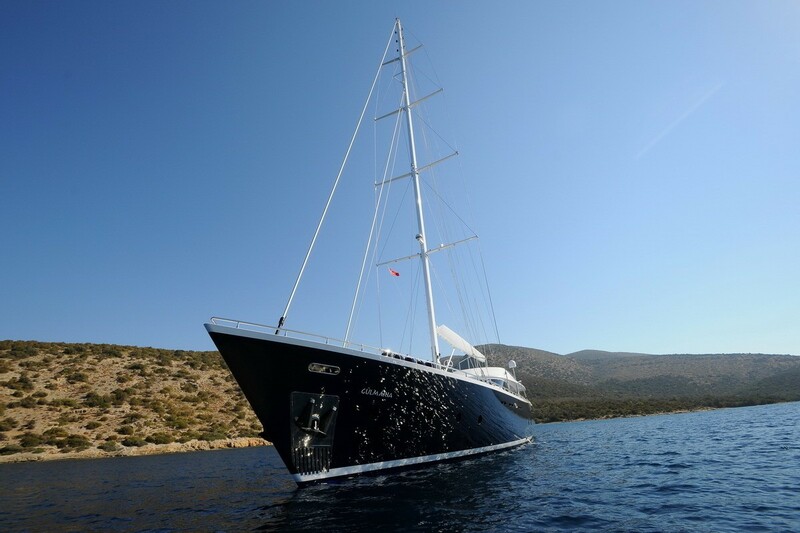 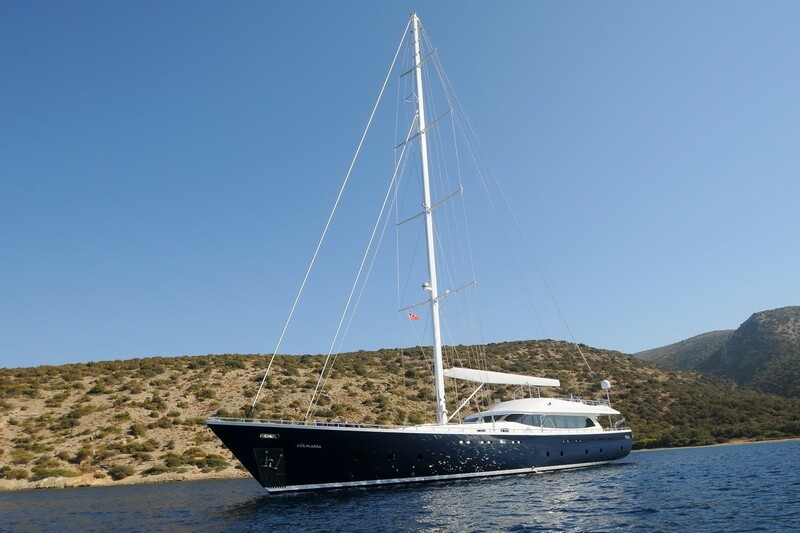 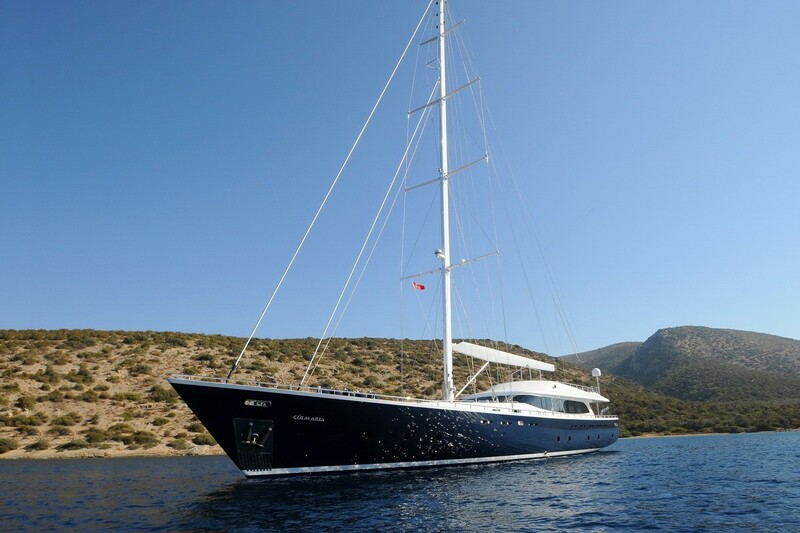 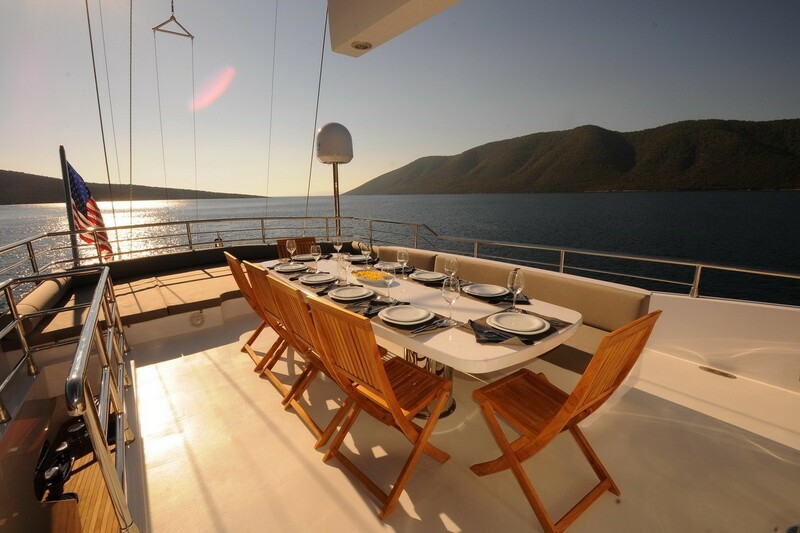 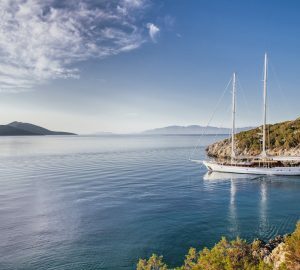 Gulet GULMARIA offers accommodation for 14 charter guests in 6 en-suite cabins, each with TV/DVD and music entertainment. 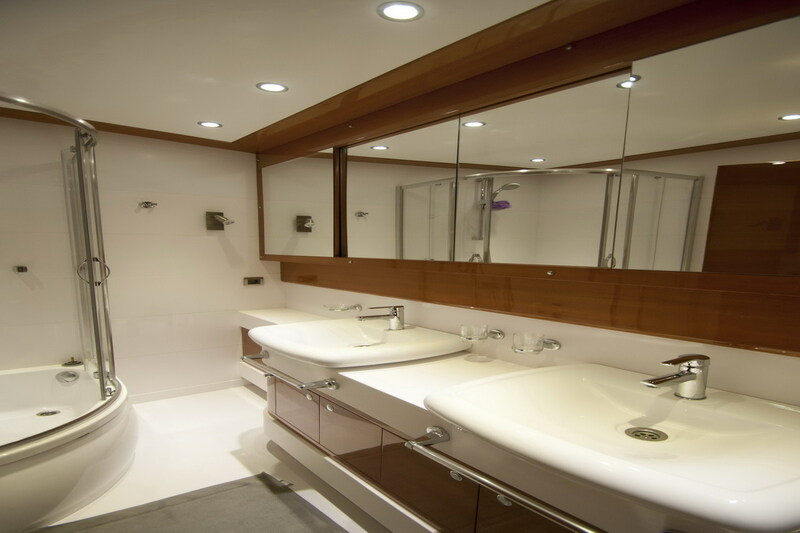 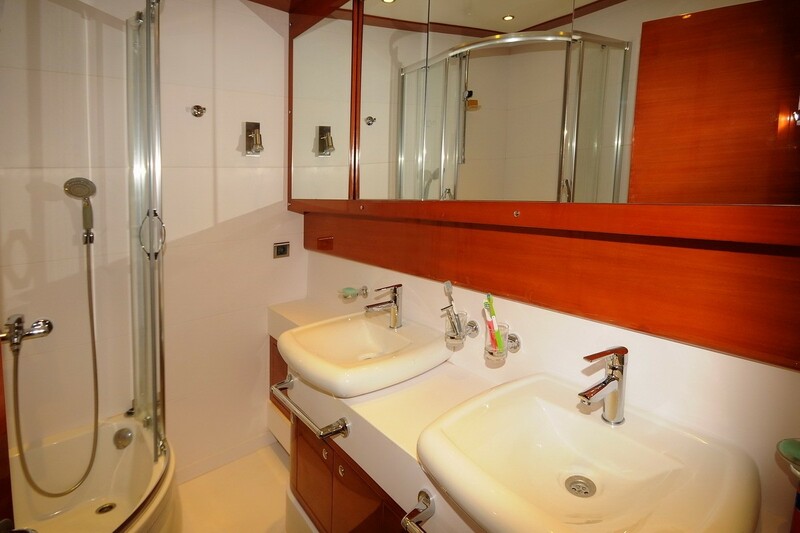 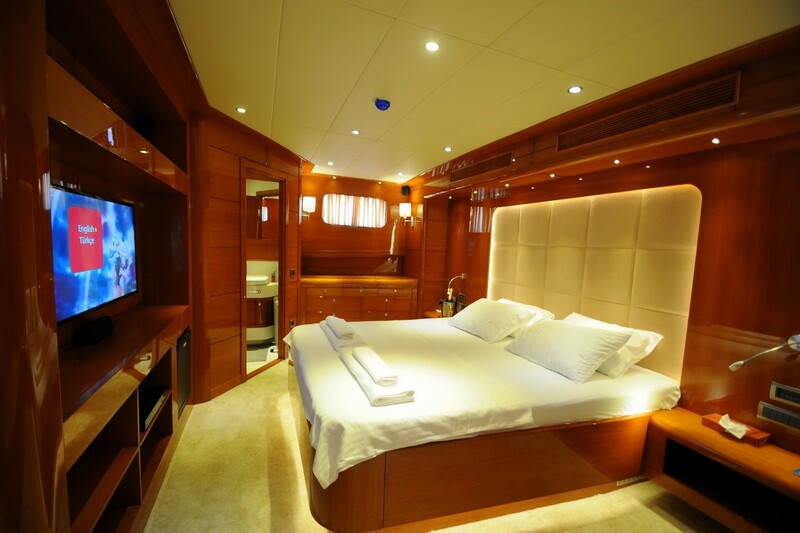 A master suite is forward and full beam of the yacht, featuring a double bed, vanity and sofa. 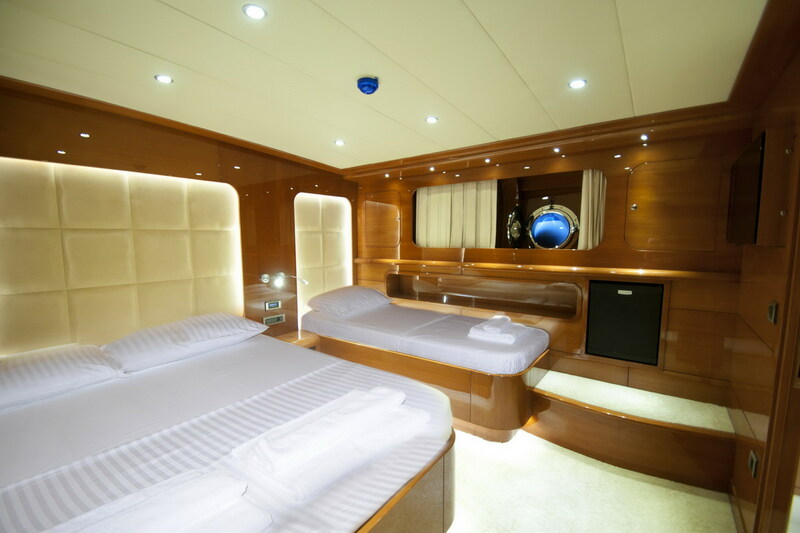 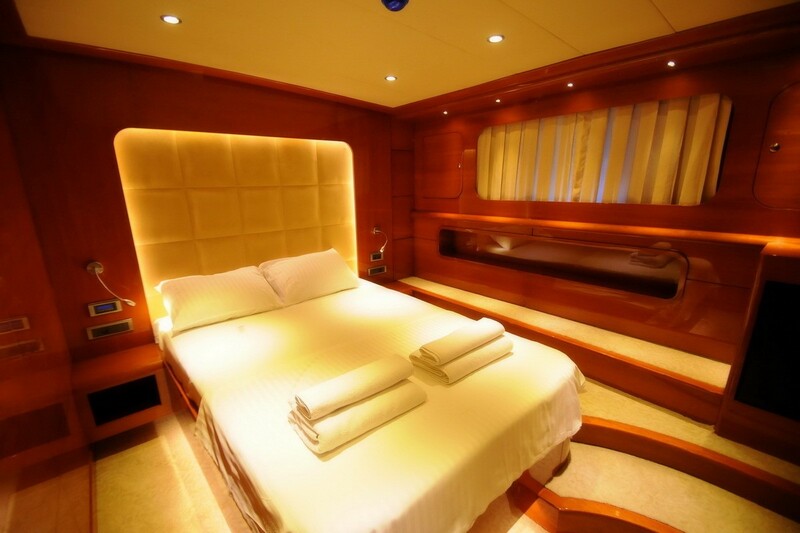 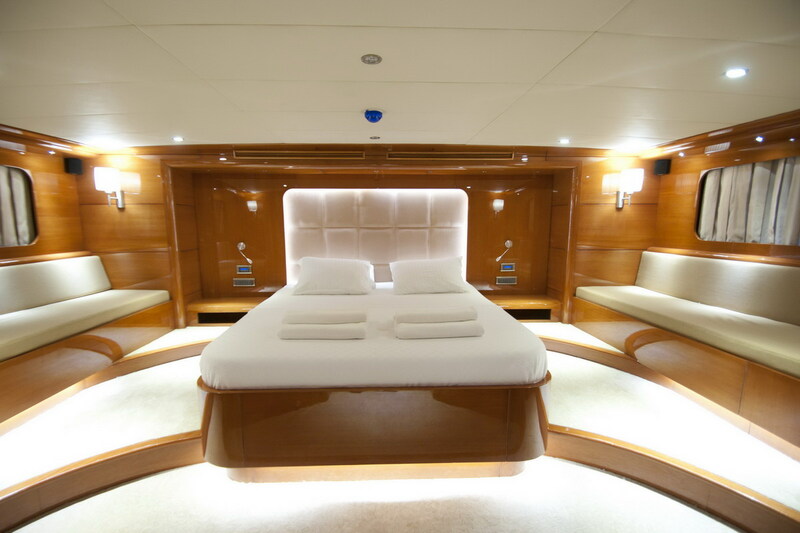 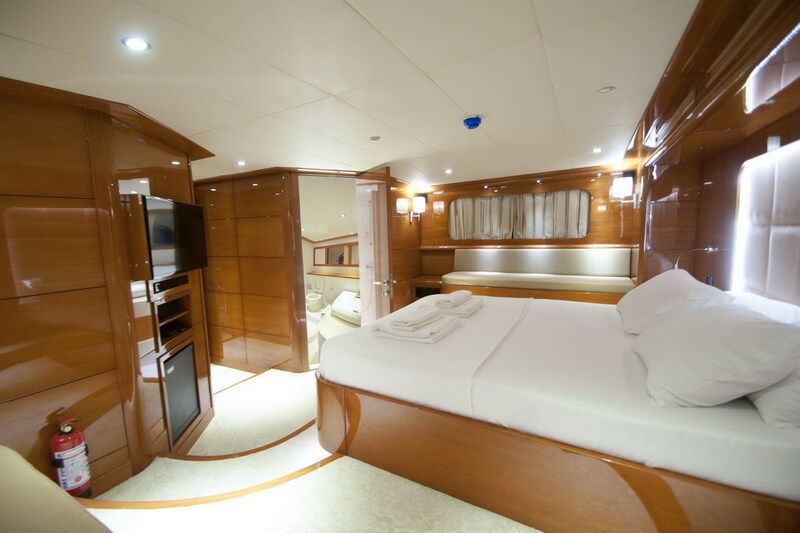 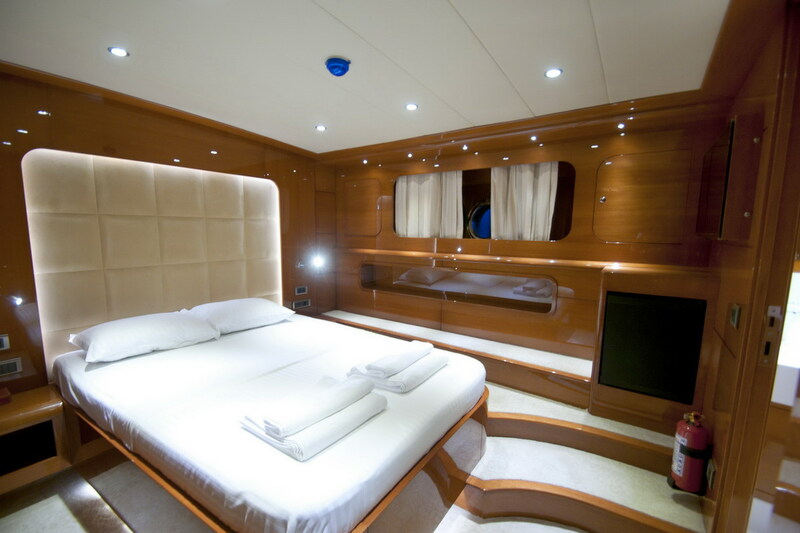 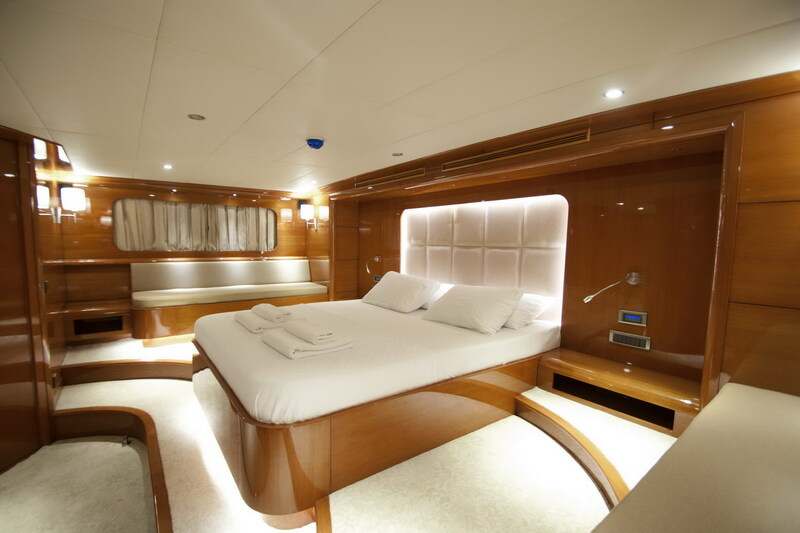 A VIP cabin is aft and full bema of the yacht, with a double bed and sofa. 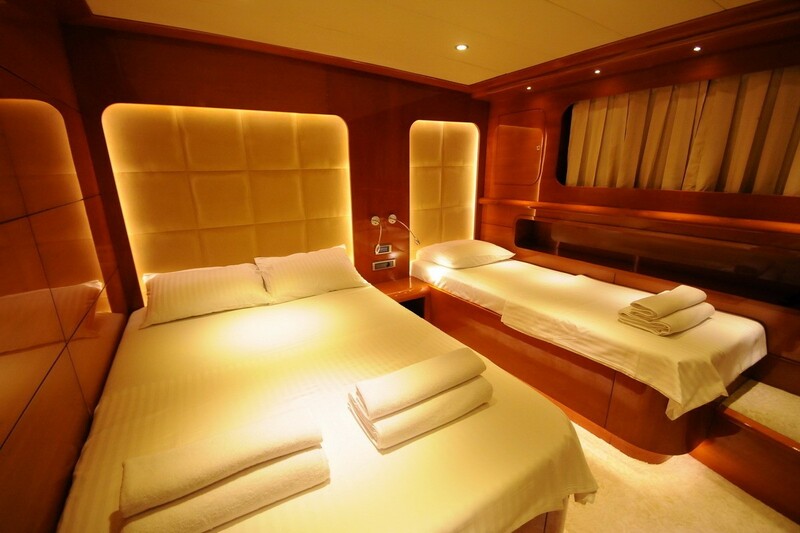 Two guest cabins have double beds and a further 2 guest cabins offer a double and single bed each. 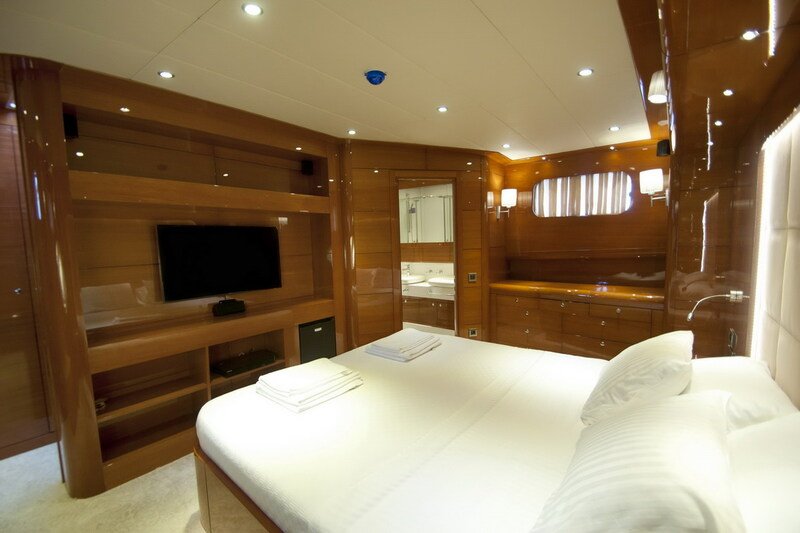 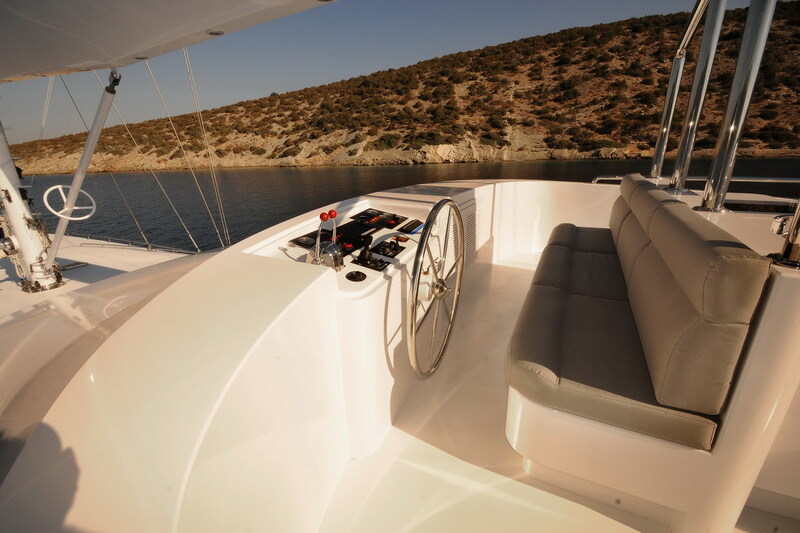 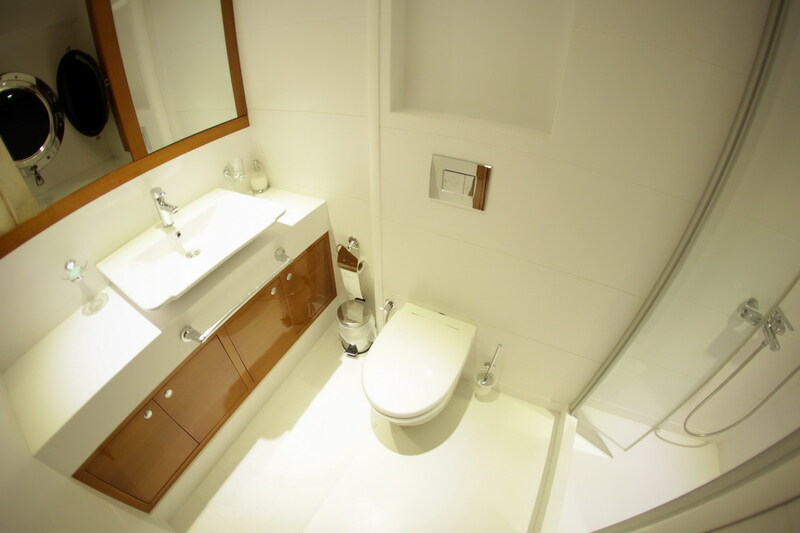 All 6 cabins are fully air conditioned for ultimate comfort.